Back cover blurb: Brighton 1930: Maureen O’Connell is a carefree girl, but her family is on the brink of tragedy, war is looming and life will never be the same again. Jack and Nelson have always been dear friends to Maureen. Despite their different backgrounds, they’ve seen each other through thick and thin. As Maureen blossoms from a little girl into a young woman, the candle she’s always held for Jack burns bright. But just as she’s found love, war wrenches them apart. The man she cherishes with all her heart is leaving. When the bombs start to fall, Maureen and her family find themselves living in the most dangerous of times. With Jack no longer by her side and Nelson at war, Maureen has never felt more alone. Can she look to a brighter future? And will she find the true happiness she’s dreamt of? An utterly gripping and heart-wrenching story about the enduring power of love, hope and friendship during the darkest of days. Perfect for fans of Pam Jenoff, Nadine Dorries and Diney Costeloe. When we danced at the end of the pier is the third novel in Sandy Taylor's Brighton Girls trilogy. You would think that this would be the concluding story of the trilogy, but no, infact this author has cleverly left the beginning til last. Maureen O'Connell is young when her family moves next door to Jack. But Maureen knows instantly she is going to marry Jack. He may be a boy, and generally they are undesirable creatures. But Jack is different. As they grow up next door to each other, Jack and Maureen do indeed become close, but Maureen is never quite brave enough to tell Jack how she feels. After having her heart broken once too often seeing him with other girls, Maureen vows to tell Jack exactly how she feels. Jack is hesistant at first, he hadn't realised that their friendship could be anything more. But quickly he realises that he feels the same. Sadly their time together is short lived as World War Two breaks out and Jack has to leave. 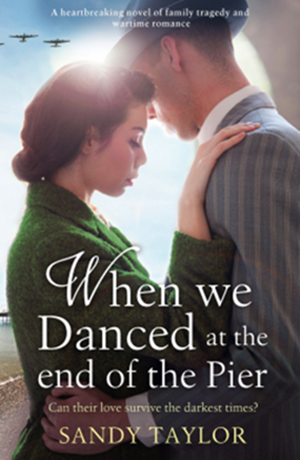 When we danced at the end of the pier is a beautifully written coming of age novel, and the perfect beginning to the Brighton Girls trilogy. When we danced at the end of the Pier Amazon online and all good book shops.